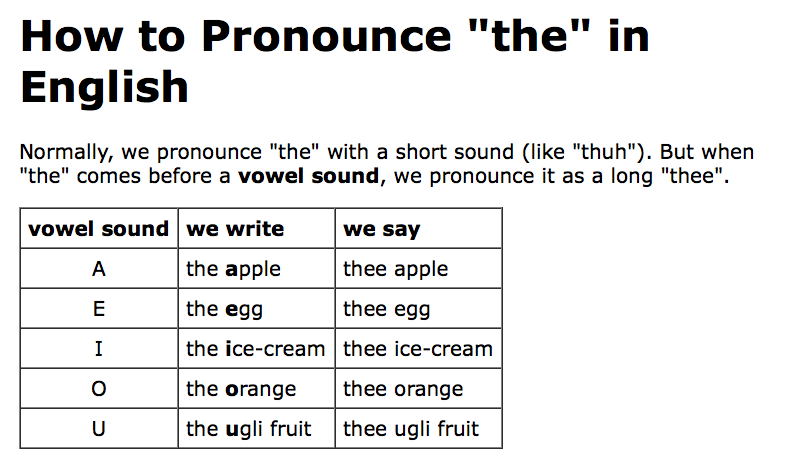 The hardtalking staff has railed about this before, but we’ll say it again: The Proper Pronunciation Of ‘The’ Before A Vowel Is Literally Disappearing. We also (should) say “thee online magazine Ozy,” as opposed to “thuh online magazine Ozy,” as NPR’s Weekend All Things Considered host Arun Rath weekly has it. This is not to pick on Arun Rath. Virtually no one at NPR knows that it should be “thee Odyssey,” not “thuh Odyssey” as an NPR reporter recently reported. We say all this More in Sorrow Than in Anger – we listen to NPR all the time. We just want it to hurt the ears a little less. This entry was posted in Uncategorized and tagged Arun Rath, EnglishClub.com, NPR, NPRniks, pronunciation of the, Weekend All Things Considered. Bookmark the permalink. Oh, John, spelling and grammar flames are petty, not pretty. But I did switch the station when someone on WGBH radio pronounced hyperbole as “hyperbowl”. Not to get technical about it, Steve, but that post is hardly a flame – it’s barely a dying ember. Before you get too wound up about NPR, you should give a listen to our own local TV characters. They commit that sin all the time, too, especially the weather entertainers. “Thuh ocean” comes to mind. Yeah, Al, but my expectations of the locals are . . . well, actually, I don’t expect anything from them. Oh, where to begin – or, rather, where to end? “Anxious” vs. “eager,” anyone?